That's right...it's Thursday, which means Theater Thursday! 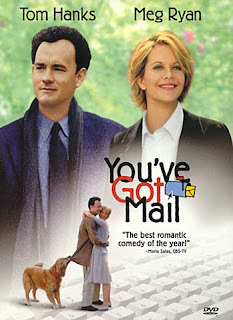 This week I'm actually breaking away from the 80's trend and recommending You've Got Mail. I personally LOVE this movie. I think it's so great. If you've ever watched Sleepless in Seattle then you know that Meg Ryan and Tom Hanks are GREAT together! It's so adorable...you find yourself rooting for who should end up together and how it should end. I can't give too much away....go watch it. You won't be disappointed! I promise! Am I ever wrong?!?! PS: You get to see the really really old version of AOL as well! You CANNOT go wrong with meg ryan. She is the best!! Love, Love LOVE Meg Ryan! This right along with Sleepless in Seattle is are some of my favs...Now I want to see it again, ha ha! I finally saw this movie the whole way through a couple of months ago. I really liked it! One of my favorite movies! And Meg Ryan and Tom Hanks are two of my favorite actors. You really can't wrong with anything staring them together. I just watched this movie today. I love it so much. I have to admit that today I watched it mostly for the sets (cause I'm weird that way), but still it was such a good movie. It just makes me smile.